Friends of Broadneck Park will be holding its first Golf Tournament fundraiser at Bay Hills Golf Club, Saturday September 15, 2012. FBP is a community effort of volunteers working with a local non-proft, Broadneck Area Youth Sports. Their goal is to improve the aging playground at Broadneck Park, located on College Parkway, Annapolis. Through fundraising efforts, they hope to provide new equipment for children ages 2-12 and make the playground accessible to children of all abilities. Broadneck Park will have the first playground in Anne Arundel County to comply with the new Americans with Disabilities Act requirements passed into law earlier this year. 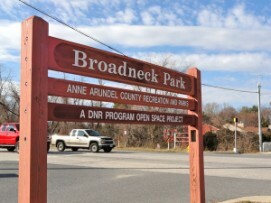 Friends of Broadneck Park has partnered with Anne Arundel County Recreation and Parks to make this extensive overhaul of the playground a reality. Please consider joining them on September 15th at Bay Hills, for a fun-filled golf tournament. For questions contact Kara McGuirk-Allison at [email protected] or by phone at 240-481-8468.